Here are headlines from the BBC on one day this last week: “new arrest over Austria migrant deaths”, “Dresden rally in support of refugees”, “hundreds of migrants arriving in Berlin”, “Greek island refugee camp growing”, “new Austria migrant vehicle found”. In common with many other news media, the BBC uses the terms “migrant” and “refugee” interchangeably. Does this matter? A migrant is “a person who moves from one place or another to find work or better living conditions”. A refugee is “a person who has been forced to leave their country in order to escape war, persecution, or natural disaster”. All refugees are migrants, but not all migrants are refugees. Evidently, the terms are non interchangeable; the Governor of the Bank of England is a migrant, but he’s not a refugee. Given the extent and chaos of Europe’s current crisis – the most extensive displacement of people since the Second World War – it could be argued that the more general term migrant is preferable. While very many of those crossing the Mediterranean are escaping war and persecution others are not, and these include criminal profiteers who control and operate the escape routes. But the case for exactitude is outweighed by the facility of simple words to mislead. To use the term “migrant” is to risk political distraction and abrogation of responsibility. Imagine waking your children in the morning. Imagine feeding and dressing them. Imagine pulling a little girl’s hair into a ponytail, arguing with a little boy about which pair of shoes he wants to wear. Now imagine, as you are doing that, you know later today you will strap their vulnerable bodies into enveloping life jackets and take them with you in a rubber dinghy – through waters that have claimed many who have done the same. Think of the story you’d have to tell to reassure them. Think of trying to make it fun. Consider the emotional strength needed to smile at them and conceal your fear. What would it feel like if that experience – your frantic flight from war – was then diminished by a media that crudely labelled you and your family “migrants”? And imagine having little voice to counter a description so commonly used by governments and journalists. The umbrella term migrant is no longer fit for purpose when it comes to describing the horror unfolding in the Mediterranean. It has evolved from its dictionary definitions into a tool that dehumanises and distances, a blunt pejorative. Behind this general point is a drier technical and legal set of issues that matter even more. Refugees have clear rights in terms of the 1951 Convention. This provides a formal definition. A refugee as a person who, “owing to a well-founded fear of being persecuted for reasons of race, religion, nationality, membership of a particular social group or political opinion, is outside the country of his nationality, and is unable to, or owing to such fear, is unwilling to avail himself of the protection of that country.” In law, refugees cannot be repatriated against their will if their life and freedom are under threat. In contrast, countries are able to deport migrants who do not have appropriate documentation, and usually do. To insist, as some governments are doing, that the many people fleeing war and violence across the Middle East and North Africa are “migrants” is to keep open the option of sending them back into the maelstrom. For example, Theresa May, in commenting on Britain’s latest annual net migration figures, catches European Union job seekers, students and refugees in the same net of “uncontrolled migration”. In calling for the reinstatement of strict national border controls, the Home Secretary places the culpability for current abuses of human rights on “the callous gangs who sell false dreams and trade on the free borders within the EU”. Theirs, though, is not the only culpability. 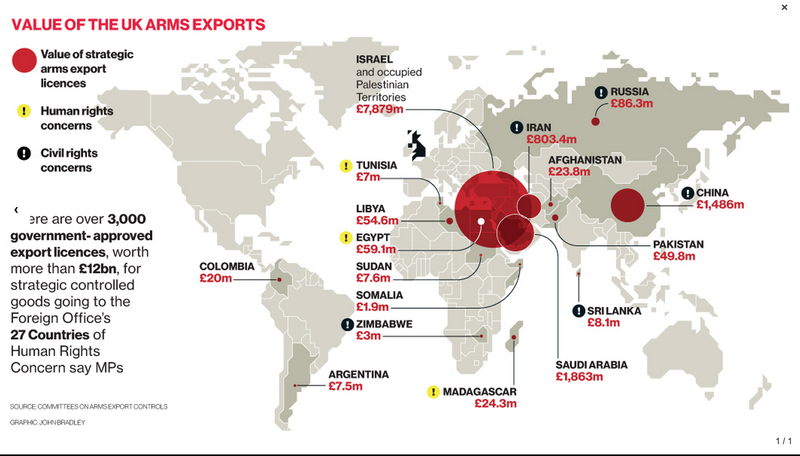 Britain is a leading arms trader, selling sophisticated weaponry and military technology across the world. There can be little doubt that some of the arms now used to force people to flee in fear for their lives were designed and manufactured in Britain, with significant benefits to the British economy. In 2013, as the present crisis across the Middle East and North Africa was escalating, a committee of Parliament reported that Britain had issued some 3000 export licences for military related equipment, valued at £12.3bn, to countries on the British government’s official human rights abuse watch list. This includes countries that are now at the epicentre of the conflicts that are driving their people into exile. source: Guardian, 17 July 2013. The current refugee crisis has no easy answers. But solutions will be all the more difficult to find when options are clouded by weasel words. Al-Jazeera is surely right. These are refugees, who are entitled to the protections set out in international law and humane appreciation of the terrible circumstances that they face. The words matter. Martin – thank you for such a succinct picture of what is happening. You have captured the issues very clearly – and the politics behind the fear.